In 2017 – even with devastating natural disasters, consumer credit data breaches, and the escalation of FinTech competition – credit union lending has continued its streak of strong performance. 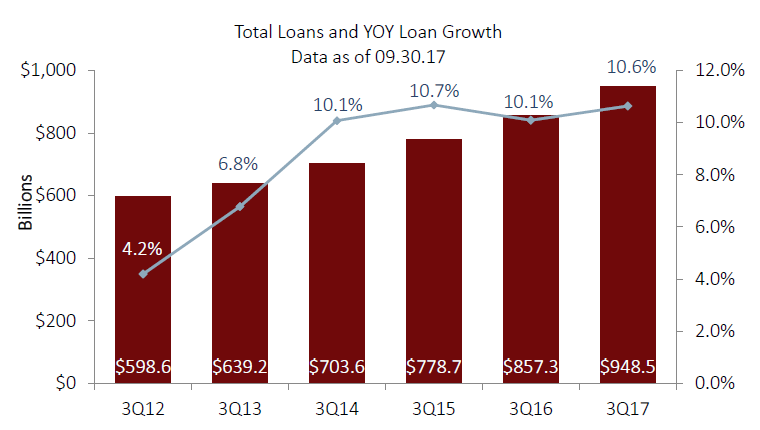 According to Q3 data collected by Callahan & Associates, aggregate credit union lending increased by 10.6% year over year as of September 2017. The rate of credit union lending growth outpaced the rate of loan growth across all U.S. banks by about threefold and, U.S. community banks – probably a more insightful competitor – by a factor of 1.5. Recent data also shows that the credit union industry’s market share in auto, first mortgage and consumer unsecured lending all increased, continuing a 5 year trend. 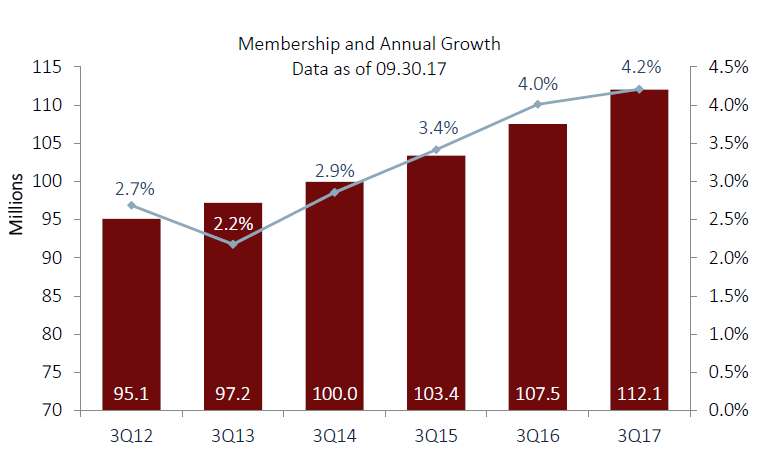 Finally, credit union membership growth was the strongest that it has been since at least 2011 (and likely earlier), with aggregate credit union membership growing by 4.2%. As strong as the past few years have been for the credit union industry, 2018 will surely have its own challenges that will influence lending. Although, it’s uncertain how exactly 2018 is going to play out from a macroeconomic, political, or regulatory perspective, here are a few broad themes that you will likely hear a lot about as we transition into the New Year, and how you can confront the related risks that will influence lending. Question for 2018: Is there actual value to support current equity prices or should we prepare for a market correction? Current Status: As of close of trading on December 12, 2017, the Dow Jones Industrial Average Index is over $24,500. That represents a 23% increase in just the last year – the “Trump-Bump” lives! The World Equity Index market cap has not only observed similar growth, but it is approaching a record high volume of $100 trillion. The potential that equity markets are overheated is supported by some absurd metrics in some of the world’s largest companies. For example, Amazon’s P/E ratio for 2017 is 275 compared to a world average of right around 18, and Amazon’s share price has increased 55% in 2017 alone. Potential Influence on Lending: The stock market represents a couple of different things to consumers that affect their enthusiasm for lending. First, lots of consumer and household wealth resides in the stock market. A market correction would directly result in a loss to consumer wealth, and potentially a change in consumer appetite and capacity for trading future consumption for current consumption (i.e. taking out a loan). Also, the performance of the stock market is directly related to consumer confidence. When consumers see a red, downward-pointing arrow on the news ticker, coupled with an anchor delivering fire and brimstone – even those that don’t have large amounts of wealth in the stock market – their confidence in the economy is affected, and consumption behavior is altered. What Credit Unions Can Do: Analyze which of your members are exhibiting risk before the next dip in the credit-cycle. Rescore your portfolio to determine who has seen a material decrease in credit quality. By proactively identifying members that are on the brink before a market correction, you can do your best to mitigate losses early-on. Risk-grading your current portfolio will also allow you to prioritize your collections efforts and shut-down open lines that could cause trouble down the road. Also, understand your loan-mix strategy, and construct your loan portfolio with diversified products to avoid concentration risk. Questions for 2018: When will the interest rate increases come from the Federal Reserve, and how fast will they increase? Will the rising rate environment be accompanied by a healthy level of inflation? Current Status: As I am currently writing this, the Federal Open Market Committee is holding their December meetings, and just announced another increase to the federal funds rate. As expected by a couple of the big banks, the December announcement also signals additional rate increases in 2018. As the Twenty Twenty Analytics Blog covered in the spring, this comes after rates were also increased in March and then again in June. Of course, rates are increasing because the Fed forecasts a healthier economy with a greater sustainability of economic growth. A key factor in how the timing of future rate hikes play out is how inflation responds. The sooner GDP growth triggers a healthy level of inflation (around 2% annually), the more eager the Fed will be to increase rates. Potential Influence on Lending: When the Fed tightens rates it will eventually flow down to consumer lending, leading to an increased consumer rate environment. This has the potential to affect loan turnover (both prepayments and refinances) as consumers may be more willing to keep their current loan with their relatively lower rate. The flip side of that is consumers in an adjustable rate product may see their payments increase to a level they aren’t able to afford, potentially triggering increased defaults and losses. What Credit Unions Can Do: Start by building additional buffers in longer term fixed rate products to offset the likely increased cost of capital. Monitor your rate sheets and make sure you are analyzing your loan segments and credit tiers for profitability. Knowing where your yield is coming from is important to maximizing it. This is likely even more important in an increasing rate environment. Knowing which of your segments are not as profitable will allow you to adjust your rate sheet or change course altogether within that segment. Question for 2018: How will the Consumer Financial Protection Bureau (CFPB) drama play out? Current Status: The uncertainty at the CFPB is a fascinating case study in, well, let’s just say succession planning. Essentially, the Trump administration took the departure of Richard Cordray, a holdover from the prior administration, to appoint an Interim Director that has a less than favorable view on the agency. This is after Cordray handpicked his deputy, Leandra English, as his successor to head the agency. At this point, confusion over who will lead the agency prevails. However, the fight is on, with lawsuits being filed by both English and Lower East Side People’s Federal Credit Union. The lawsuits cite “regulatory chaos” and declare English as the rightful Director. Potential Influence on Lending: Many are expecting that President Trump seizing control of the CFPB is the first step towards abolishing it. Clearly, no matter your view on the CFPB, any confusion surrounding the entity doesn’t help lending. Not knowing who is in charge or what rules to follow certainly make for a tougher lending environment. The fact that lawyers are now involved signal that this may be a protracted process. What Credit Unions Can Do: This feels like a trick question. Any advice regarding how to predict and navigate something so politically entangled seems trite. What you can do, however, is hold your institution to a higher standard than what has been set by the folks in Washington D.C. For example, if you are concerned about a fair lending issue, don’t wait for the CFPB to sort itself out, be proactive. Perform an analysis comparing your average interest rates to different demographic factions within your loan portfolio. Take a look and analyze if you are lending fairly to different neighborhoods within your geographic scope. No matter what 2018 brings, the credit unions that will stand the strongest at the end of the year will be those that understand the economic and regulatory factors influencing the lending environment, and are proactive in using the data at their fingertips to make informed decisions. Our bread-and-butter is our default-risk grading model that was born out of the 2008 Financial Crisis. We have experience applying it to hundreds of credit unions across all asset-size ranges. Our model not only helps credit unions confront credit and collateral risk, but allows credit unions to understand their risk-adjusted capital position, apply stress scenarios, and establish concentration limits, as well. We assist our clients in identifying their after charge-off yields throughout all combinations of loan type and credit tier. We are able to use this data to identify where charge-offs are hurting the credit union most, and where the interest rate sweet spots are in your portfolio. Our analytics are used by credit unions to identify market penetration strategies within their membership. Using your own data, we can easily define target segments for automobile remarketing, proactive credit line increases, and home equity products. If you are interested in learning more about how Twenty Twenty Analytics can help you navigate 2018, feel free to reach out to us, and we would be glad to tell you more.